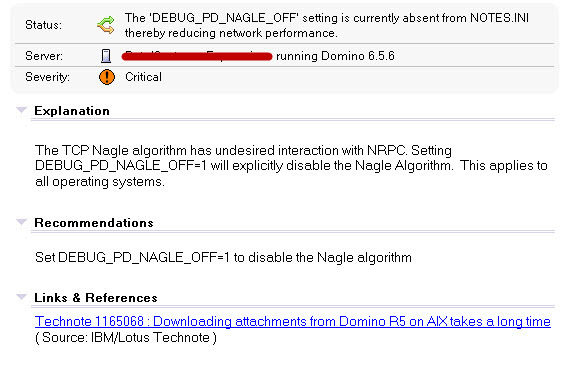 I was running DCT (Domino Configuration Tuner) and it flagged a certain setting as Critical for me. That struck me as odd, so I took a look at it. I had never heard of this setting before, and for good reason. 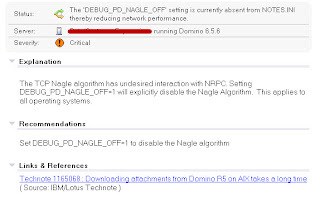 My Server is a Domino 6.5.6 server running on Windows, and the ini variable is for Domino 5.0 running on AIX. So, who to I let know about this bug? The report in your screen shot should also reference this wiki post, which explains that you really do want to make the change. We'll get this link included in the report generated by the May DCT rule update. Thank you for noticing and posting.